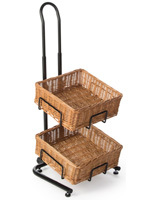 This vintage look 3 tier wicker display is designed for use in commercial or service businesses, retail shops, hospitality or even home environments. 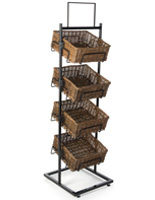 Each sturdy black metal frame stand is 38" tall with three loops for the baskets. 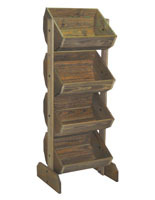 The freestanding 3 tier wicker display with sign clips mimics the look of old-school cast iron market or shop fixtures. The woven bins are ideal for drawing attention to any items, from toiletries to fresh fruits or vegetables. The cast iron base 3 tier wicker display is a traditional market fixture that can complement retail stores, spas or home kitchens. 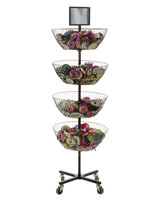 Whether used for displaying fruits, toys, toiletries or key chains, this elegant woven fixture is an eye catching addition to any environment. 15.0" x 38.0" x 16.0"